Long noncoding RNAs (lncRNAs) have been shown to play important roles in various organisms, including plant species. Several tools and pipelines have emerged for lncRNA identification, including reference-based transcriptome assembly pipelines and various coding potential calculating tools. 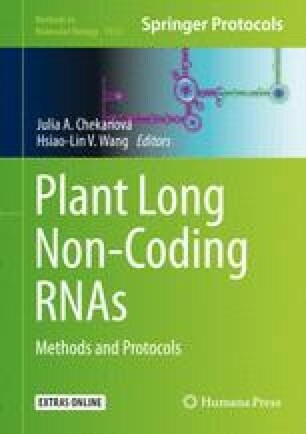 In this protocol, we have integrated some of the most updated computational tools and described the procedures step-by-step for identifying lncRNAs from plant strand-specific RNA-sequencing datasets. We will start from clean RNA-sequencing reads, followed by reference-based transcriptome assembly, filtering of known genes, and lncRNA prediction. At the end point, users will obtain a set of predicted lncRNAs for downstream use. This work was supported by grants from the Hong Kong Research Grants Council Area of Excellence Scheme (AoE/M-403/16); CUHK VC Discretionary Fund (VCF2014004); National Key Research and Development Program–Key Innovative and Collaborative Science and Technology Scheme for Hong Kong, Macau, and Taiwan (2017YFE0191100); CUHK Direct Grant (3132782); and the Lo Kwee-Seong Biomedical Research Fund to H.-M.L.